Options in India: WYSIWYG? More than meets the eye? WYSIWYG? More than meets the eye? 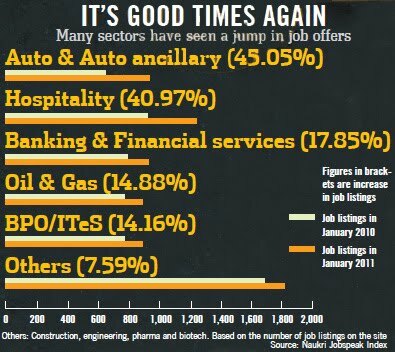 It is that time of the year with the media going ga-ga over the "Hot market with Cool jobs"! One cannot miss seeing the euphoria in the news, views & reports on the booming salaries-all across -from campus placements to CEO compensation. (Indian CEOs at par with global peers). We, as all of us recruiters will confirm, are seeing a huge deluge of mandates. Many firms are looking to hire afresh and putting on some muscle, back again-after having lost both fat and muscle when they cut headcount in the last couple of years. The general bonhomie inspires a lot of casual enquiries from most professionals wanting to keep tab of their 'contemporary' market value. Even as people are preparing for the celebrations, I wish to take a pause! The flip side: the real world? a) The flyer of a "* most promising B-Schools in Asia" on the windscreen of my car is perhaps a tell tale sign of the times. Last night, as I got back to the parking lot after being enthralled by a Russian Ballet troupe at an "international festival of dance'-there was this flyer. Innovative way to catch one's attention-especially since it was perhaps an elite 'invite-only' event-with a lot of corporate bigwigs and a segment of 'who's who in Hyderabad' -and a great cross section of decision makers -both from the demand & the supply side. Surely there must be better ways of marketing a classy 12 page-glossy multi colour brochure listing out the heritage of the governing board, 'international accolades', insight into the curriculum/ core faculty/course structure, and a few endorsements from some esteemed recruiters...? Or is it hard sell? b) and a couple of conversations I have had in the last 3 days-this week! -One expressed his disappointment of the 'available crop' of the pass outs of a world class global B School (GMAT scores of about 700 and average 5yrs of experience) where there they had visited last week for lateral hires. True, the company had got a slot only on the 'day 3' when the cream was apparently already picked by the early birds. "The quality of the talent wasn't just inspiring. And in cases of a fit, the salary expectations were just not in sync with the value they could add". -The HR head of an India development centre of a global software company is under pressure to ramp up headcount before the March end-lest the HO isn't convinced about the long term ability to attract, and retain global talent -and jeopardising the long term growth visavis other global ODCs in the organisation. Considering that most competitors have enforced a notice period of 2-3 months before a person can be relieved, the option is 'to hunt for those restricted to already serving out notice period with their present employers'! c) It is interesting to read this week's issue of Business World on the issue of 'runaway salaries'. Based on analysis of data of 2,601 companies sourced from the Centre for Monitoring Indian Economy (CMIE) for the period 2005-10, sales of companies grew at an average of 53.6 per cent. and, the average compensation paid to employees grew faster at 58.8 per cent. Is it not a Catch 22 situation. If a company wants to be competitive it has to pay well. With the talent shortage, doesn't it make sense that one has to pay well -not just to stay in the same place-but also to get ahead! While on the supply side, it is disturbing to see the impact of the professional global B schools in grooming 'industry ready" managers, focussing instead on 'higher salaries & an impressive placement record' -for better brand equity- it is shocking to see the sheer lack of imagination in terms of investment in creating a talent pipeline from the demand side (the employers)-often giving in to short cuts as the easier way out. Somewhere-the pieces don't fit in. One would have thought that if the last three years were marked with chaos, complexities, confusion, with the year 2011 promising to be the time for confidence-we could expect some more clarity regarding the road ahead!! As of now, I am a little disappointed-that most of our HR fraternity are still in a time warp. Juggling around with tactics-putting a band aid here and attending to a puncture there!! Still hung about 'cost of hire'. Or the source of the resume? Content with carpet bombing and selecting 1 out of 40-50 profiles one screens..
Come on, isn't it time to grow up? Will what got us here- help us navigate through the next few years? -accept that it in the intellectual economy, the 'employee' would make the choices based on her/his career aspirations...and so it is imperative to build a model to help better career management as a magnet? To farm or grow talent for those perennial skill sets- instead of poaching & JIT? Unlike best practices in the manufacturing industry -we aren't managing commodities..we are dealing with a bundle of human emotions, abilities & aspirations-who are increasingly beginning to exercise their mind! For one, can we shift the sourcing mindset to looking at more holistic hiring solutions?Shift the focus from 'cost of hire' to 'quality of hire'? Time to go beyond 'cut and paste job descriptions handed over' to qualifying competencies required to succeed? Or is it that I am being too cynical? Am I missing something? I shall be glad to be enlightened. The recession should have given everyone a breather to stabilize and get their act together.Instead, HR continues to deal with fires all over again as if nothing had changed. As you can see there is no alignment between the 3 key stakeholders. 2 stakeholders (students and b-schools) are working jointly towards maximizing value extraction from the 3rd (corporates). What are corporates doing? Accepting this as if they are helpless! My read is that they are either too lazy to attempt fixing the problem or simply not bothered. Things could change rapidly if corporates simply chose/pegged b-schools on 'b-school student performance for 2-3 yrs post recruitment'. In my work with clients, I have come across situations quite often when HR Managers complain about 'business' not understanding how difficult it is to recruit and not giving adequate time for recruitment. Whenever I have heard the 'business' side of the story, the complaint has been about HR not providing adequate quality. Surprising how in a simple process 2 stakeholders can be consistent about being unhappy, but on two very different metrics. The solution is for HR to get it's act together on the quality of their process of recruitment rather than the timeline alone.Talent quality suffers when we don't understand the difference between 'fast-food' and 'a dining experience'. Data analysis is dangerous and can cut both ways. My concern about the Business World article is that it presents the data to support a viewpoint...and quotes consultants who share the same viewpoint. Whereas interestingly, HR practitioners quoted in the article tend to have a different perspective. Funny, specially since most of the consultants quoted in the article do not have compensation data gathering or benchmarking expertise (if they have developed it in the past 6 months, my apology for being ignorant). A more appropriate analysis would have been the comparison of 'gross margin growth' vs. 'total payroll cost growth'. A large part of the compensation increase in India is inflation adjustment. If my estimates are correct, inflation adjustment has typically been 8-9% every year for the past 10 years or more. Now take gross margins. You need to isolate the impact of gross margin shrinkage due to rising input costs other than compensation. PS: In contrast, I recently saw the comments of the head of a HR consulting firm in India. When asked about emerging trends in talent management, the consulting professional mentioned 'flexibility', 'speed', 'balance' etc. Goes to reinforce my belief - in India HR practitioners are more clued in than HR consultants. Not surprising given that most HR practitioners and HR consultants come from the same B-Schools, but the practitioners spend years honing their skill by solving real world HR problems.